Save Money With Regular Visits To a Family Dentist in Norwood! They say an ounce of prevention is worth a pound of cure. Never does that statement apply more than when it comes to your health – including your oral health! By scheduling regular, routine dental care for you and your family, you’re making sure that any potential problems are found as early as possible when they’re simpler and less expensive to fix. Since pretty much everyone is looking to save a little money these days, a great place to start is by scheduling a checkup and cleaning for the whole family with a family dentist in Norwood! How Does Routine Dental Care Save You Money? If you neglected to get regular oil changes for your car, you wouldn’t be surprised if it eventually broke down. Of course, the large repair bill wouldn’t be a surprise either! If children get large cavities on their baby teeth and have to have them taken out early, there’s a good chance the permanent teeth won’t come in properly, which can be expensive to fix down the road. But if children are getting regular dental care, those cavities can be found early on and taken care of before they turn into bigger problems. Gum disease affects millions of Americans and attacks the gums and underlying bone that support the teeth and keep them in place. It can result in tooth loss in advanced stages, but with early intervention, that can be prevented. Many people think that they would know if they had cavities because they’d be in pain. In fact, most people won’t feel a cavity until it’s gotten larger. At that stage, it requires a larger, more expensive filling or even a root canal and crown. The good news is that routine dental X-rays catch cavities before they reach that point! 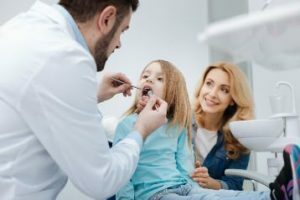 What Are the Advantages of Seeing a Family Dentist? It goes without saying that most people are incredibly busy these days! One easy way to save a lot of time is to schedule the whole family with the same dentist in Norwood. That way, you won’t have the hassle of making multiple appointments or driving all over town for everyone’s dental visit. By seeing a family dentist regularly, everyone in the family gets great care and you save yourself time and money. It’s a win-win situation! Dr. Robert Viventi is a general, restorative and cosmetic dentist and a father of two. He’s been providing outstanding dental care to patients of all ages for over 30 years and gets a lot of professional satisfaction from establishing long-term relationships with all the families in his practice. If you have any questions he can be contacted via his website or at (781) 769-3566. Comments Off on Save Money With Regular Visits To a Family Dentist in Norwood!